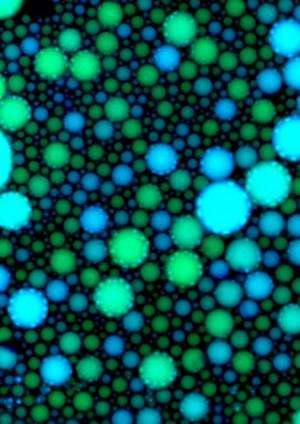 False color image of fluorescence within water-in-oil droplets containing a biochemical oscillator. Droplet-to-droplet variability in the fluorescence indicates noise in the preparation and operation of the oscillator circuitry. Droplet diameters range from less than 1 micron to more than 20 microns. Engineers like to make things that work. And if one wants to make something work using nanoscale components—the size of proteins, antibodies, and viruses—mimicking the behavior of cells is a good place to start since cells carry an enormous amount of information in a very tiny packet. As Erik Winfree, professor of computer science, computation and neutral systems, and bioengineering, explains, "I tend to think of cells as really small robots. Biology has programmed natural cells, but now engineers are starting to think about how we can program artificial cells. We want to program something about a micron in size, finer than the dimension of a human hair, that can interact with its chemical environment and carry out the spectrum of tasks that biological things do, but according to our instructions." Winfree and his coauthors began their investigation of the effect of small sample size on biochemical processes with a biochemical oscillator designed in Winfree's lab at Caltech. This oscillator is a solution composed of small synthetic DNA molecules that are activated by RNA transcripts and enzymes. When the DNA molecules are activated by the other components in the solution, a biological circuit is created. This circuit fluoresces in a rhythmic pulse for approximately 15 hours until its chemical reactions slow and eventually stop. The researchers then "compartmentalized" the oscillator by reducing it from one large system in a test tube to many tiny oscillators. Using an approach developed by Maximilian Weitz and colleagues at the Technical University of Munich and former Caltech graduate student Elisa Franco, currently an assistant professor of mechanical engineering at UC Riverside, an aqueous solution of the DNA, RNA, and enzymes that make up the biochemical oscillator was mixed with oil and shaken until small portions of the solution, each containing a tiny oscillator, were isolated within droplets surrounded by oil. "After the oil is added and shaken, the mixture turns into a cream, called an emulsion, that looks somewhat like a light mayonnaise," says Winfree. "We then take this cream, pour it on a glass slide and spread it out, and observe the patterns of pulsing fluorescence in each droplet under a microscope." When a large sample of the solution is active, it fluoresces in regular pulses. The largest droplets behave as the entire solution does: fluorescing mostly in phase with one another, as though separate but still acting in concert. But the behavior of the smaller droplets was found to be much less consistent, and their pulses of fluorescence quickly moved out of phase with the larger droplets. Researchers had expected that the various droplets, especially the smaller ones, would behave differently from one another due to an effect known as stochastic reaction dynamics. The specific reactions that make up a biochemical circuit may happen at slightly different times in different parts of a solution. If the solution sample is large enough, this effect is averaged out, but if the sample is very small, these slight differences in the timing of reactions will be amplified. The sensitivity to droplet size can be even more significant depending on the nature of the reactions. As Winfree explains, "If you have two competing reactions—say x could get converted to y, or x could get converted to z, each at the same rate—then if you have a test tube–sized sample, you will end up with a something that is half y and half z. But if you only have four molecules in a droplet, then perhaps they will all convert to y, and that's that: there's no z to be found." In their experiments on the biochemical oscillator, however, Winfree and his colleagues discovered that this source of noise—stochastic reaction dynamics—was relatively small compared to a source of noise that they did not anticipate: partitioning effects. In other words, the molecules that were captured in each droplet were not exactly the same. Some droplets initially had more molecules, while others had fewer; also, the ratio between the various elements was different in different droplets. So even before the differential timing of reactions could create stochastic dynamics, these tiny populations of molecules started out with dissimilar features. The differences between them were then further amplified as the biochemical reactions proceeded. "To make an artificial cell work," says Winfree, "you need to know what your sources of noise are. The dominant thought was that the noise you're confronted with when you're engineering nanometer-scale components has to do with randomness of chemical reactions at that scale. But this experience has taught us that these stochastic reaction dynamics are really the next-level challenge. To get to that next level, first we have to learn how to deal with partitioning noise." For Winfree, this is an exciting challenge: "When I program my computer, I can think entirely in terms of deterministic processes. But when I try to engineer what is essentially a program at the molecular scale, I have to think in terms of probabilities and stochastic (random) processes. This is inherently more difficult, but I like challenges. And if we are ever to succeed in creating artificial cells, these are the sorts of problems we need to address."